If these monster hunters had been part of the Scooby Doo gang, I think some of those villainous landlords and greedy amusement park owners might’ve gotten away with their schemes. I’m glad Bigfoot remembered to stay hidden (sort of) but I still think Scout’s right — there’s trouble ahead. Reubens Weekend with the National Cartoonists Society hits Philadelphia this weekend. Bigfoot, Scout, and I are up for an award, as you know, so I’d like to help you guys get ready. NOMINEES FOR THE ONLINE COMIC STRIP/LONG FORM AWARD: John Allison (“Bad Machinery”), Vince Dorse (“Untold Tales of Bigfoot”) and Ru Xu (“Saint for Rent”). SHOULD WIN: Allison’s stylish thriller weaves a complex and compelling tale, but its sizable cast and complex mythology might cost it some votes. WILL WIN: Dorse’s strip won this division a few years ago, and if anything, his work on “Bigfoot” has grown even more impressive since then. So. It seems the crew at Hogan’s Alley have some confidence in UToB. But I’ve seen the other two nominees’ work and I gotta say — just being a part of that group is an honor. Reuben or not, thanks to everyone for all the support! There’s a Reubens event Sunday at the Free Library of Philadelphia that you can all come to! 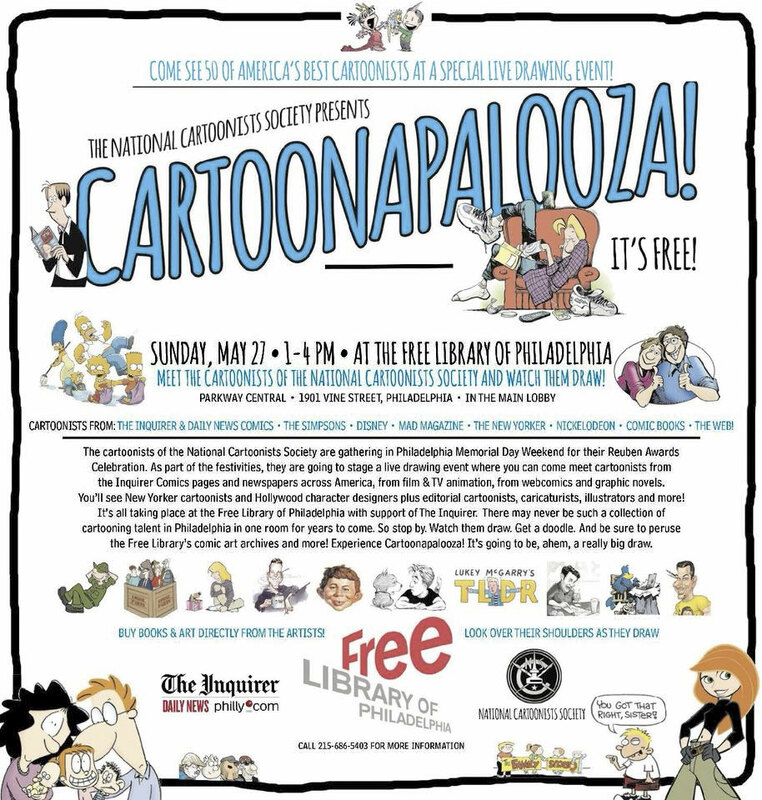 Cartoonapalooza is a gathering of NCS cartoonists (all of them more famous and beloved than I) who will be there to sell/sign books and sketches, kinda’ like a mini-comicon. The event runs 1 to 4 on Sunday, is free to attend, and it should be a blast (though that “look over their shoulders as they draw” line in the ad creeps me out a little). I hope to see some of you there if you happen to be (or live) in the area. On May 17th (just a few days ago!) eyewitnesses in Chile saw six or more UFOs soaring through the skies above them. There’s video, but it’s hard to tell what’s going on. Are they jets? Shape seems wrong. Meteors? Movement seems a little slow and organized. What do you think? Before you answer, you should know that there was another sighting on that day in the sky above St. Patrick Cathedral in Ireland. Is it the same sort of craft? Very hard to tell from the video. But as with most of these sightings, it’s really all in the eye of the beholder. You decide. YIKES! WHO THOUGHT THAT TARP WOULD COME TO LIFE??!! Looking forward to photos next week—have fun and bring that Reuben home!